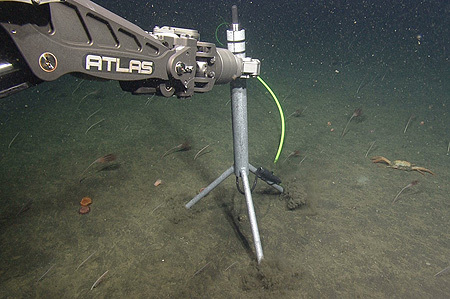 This photo shows MBARI’s deep-sea hydrophone being placed on the seafloor by the manipulator arm on MBARI’s remotely operated vehicle Ventana. The green cable carries power to the hydrophone and data back to shore through the MBARI’s cabled undersea observatory. Researchers at the Monterey Bay Aquarium Research Institute (MBARI) have learned a lot about Monterey Bay using robotic submersibles to look deep below the bay’s surface. Now they can listen to the bay as well, using an ultra-sensitive underwater microphone. Sounds recorded by this hydrophone have already provided surprising information, including evidence that beaked whales, though rarely seen, are common in the outer bay. 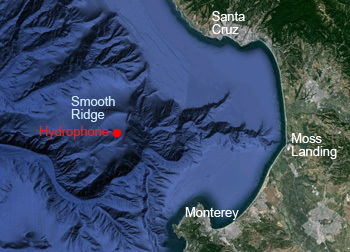 In July 2015, MBARI researchers installed a broadband hydrophone on Smooth Ridge, about 30 kilometers (18 miles) from shore and 900 meters (3,000 feet) below the sea surface. Since that time, signals from the hydrophone have been relayed back to shore in real time, 24 hours a day, using MBARI’s cabled ocean observatory, the Monterey Accelerated Research System (MARS). Most adults (at least those who haven’t attended too many rock concerts) can hear sounds from about 20 Hertz (the low rumble of an earthquake) up to 16,000 Hertz (the high-pitched buzzing of a mosquito). However, the new hydrophone can pick up sounds from 10 to 128,000 Hertz. During a recent meeting with underwater acoustics experts, Ryan played a few of the distinctive sounds recorded with the hydrophone. The first were low-frequency sounds that resembled a semi-truck downshifting. Ryan explained that these were the calls of blue whales. At about 10 Hertz, these calls are only audible when “sped up” by computer software and played through subwoofer speakers. Next Ryan played a series of high-pitched whistles and clicks. The experts speculated these were from common dolphins and Risso’s dolphins, respectively. These animals can make (and presumably detect) sounds as high as 60,000 Hertz. 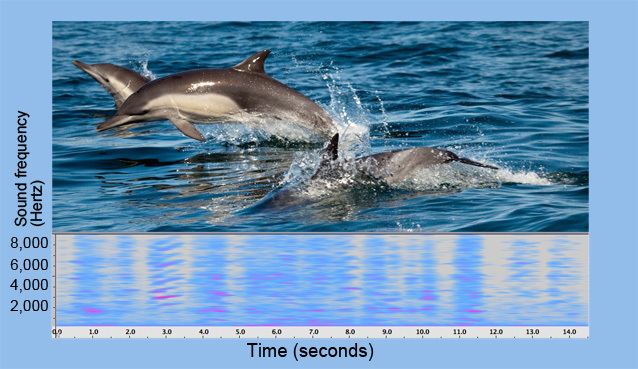 Below this photo of common dolphins is a spectrogram of dolphin calls recorded by the MARS hydrophone in Monterey Bay. Dolphin photo courtesy of Chad King, NOAA. Click the triangle below to play a recording of the dolphin calls shown in the spectrogram. Ryan then played a high-pitched sound that resembled a person rubbing a balloon, but none of the experts at the meeting could begin to guess what made that noise. Ryan also played a recording of what sounded like sea lions barking underwater. In some of the clips, the calls of many different animals overlapped like the chatter of voices at a busy cocktail party. For Ryan, picking out a few sound clips to play at the meeting was relatively easy. The bigger challenge has been analyzing the ongoing deluge of data from the hydrophone—about two terabytes a month. 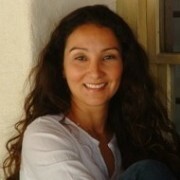 Cline is presently testing and expanding a program originally developed by MBARI summer intern Prateek Murgai. At this point, the software can identify a few very distinctive calls, such as the deep rumbles of blue whales. But it doesn’t work as well for calls that are not as distinctive or consistent, especially when there is lots of background noise. 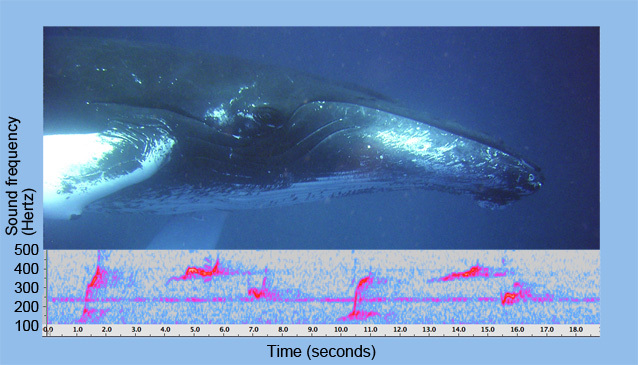 Below the photograph of a humpback whale (top) is a spectrogram showing calls from one or more humpback whales recorded by MBARI’s deep-sea hydrophone. Humpback photo courtesy of NOAA. Click the triangle below to play a recording of the humpback calls shown in the spectrogram. Noise in the ocean is a particular concern for researchers at the Monterey Bay National Marine Sanctuary. They hope to use data from MBARI’s hydrophone to understand how the relatively quiet “soundscape” of the outer Monterey Bay compares with busier areas such as the Southern California Bight. By far the loudest sounds recorded by the hydrophone are from boats and ships passing by. Several researchers have already analyzed brief sound clips from the hydrophone to identify the sounds of individual boats and ships. For example, on December 30, 2015, a supermassive container ship sailed northward past Monterey Bay, on its way to San Francisco Bay. An analysis by marine acoustician Mark Fischer showed that the hydrophone picked up extremely low-frequency (one to 10 Hertz) sounds from this ship for almost 11 hours. The sounds were first detected when the ship rounded Point Sur, about 70 kilometers (42 miles) south of the hydrophone, and continued until the ship approached the Golden Gate, about 125 kilometers (80 miles) to the north. This was just one of several discoveries researchers made while analyzing small amounts of data from the hydrophone. Another unexpected finding was that calls of Baird’s and Cuvier’s beaked whales were much more frequent than anyone expected. These whales spend most of their time diving in deep water and are almost never seen at the surface, so very little is known about them. To share his exciting discoveries with students and the general public, Ryan worked with MBARI engineers to design a mobile sound system that can play back some of the sounds recorded by the hydrophone. Ryan and Cline are also developing a web page where researchers and the public will be able to browse through spectrograms from the hydrophone, listen to some of the sounds that have been recorded, and (eventually) hear recordings from the hydrophone in near-real time. 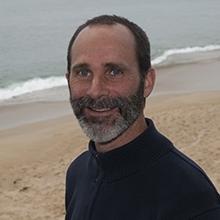 NOTE: MBARI oceanographer John Ryan will be playing recordings from MBARI’s new hydrophone on a specially designed sound system at the Monterey Bay National Marine Sanctuary’ Sanctuary Exploration Center in Santa Cruz on February 27, 2016.